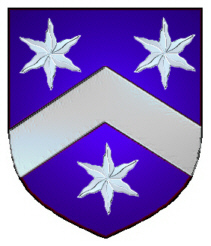 Coat of Arms: A blue shield with a silver chevron between three silver estoiles. 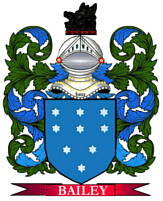 Spelling variations of this family name include: Carr, Kerr, O'Carr, O'Carry, MacCarry, Kerrane and many more. First found in Connacht where in 1095, the annals of Loch Cé list the death of Muirchertach Ua Cairre, "steward of Cenél Aengusa and royal heir of Oilech. Some of the first settlers of this family name or some of its variants were: Bradbury Carr, a Scotch-Irish settler, who came to New Hampshire in 1732; Andrew Carr, who arrived in New Castle, Delawarer in 1789; Dennis Carr, who arrived in New York in 1803. 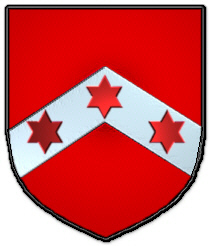 Coat of Arms: Red with silver chevron on which there are three red stars. Motto Translated: Late but in earnest. Spelling variations of this family name include: Kerr, Car, Carr, Ker, Cearr (Gaelic) and many more. First found in Lancashire where they were seated from very early times and were granted lands by Duke William of Normandy, their liege Lord, for their distinguished assistance at the Battle of Hastings in 1066 A.D. Some of the first settlers of this family name or some of its variants were: William Ker, who settled in New Hampshire in 1718; David Kerr arrived in Jamaica in 1775; John Carr settled in Virginia in 1716; Alexander, Andrew, Edward, Frank, Henry, Horace, Hugh, James, John, Joseph, Mathew, Robert, Samuel, Thomas and William Kerr, all arrived in Philadelphia between 1800 and 1860.